Here in Jackson this week we've been treated to oodles and oodles of wet wet wet snow and poor visability for the big snow days. I grabbed the DPS 112 and headed out and found untracked snow to be a blast. Very easy to manuver in tight situations, playful and very co-operative..... AND then...the piles piled up, the wet snow packed in and I was skiing 1800 vert of bumps and piles of compressed snow with wet snow covered goggles and poor visability....scrum ptous ! THE DPS are NOT the right ski for this.....it's weakness by my experience. Since the shovels LOVE to ride over the tops of the wet piles, I was making air turns and riding up and down like a rollar coaster. Now I did have fun, but on a day like that day, a stiffer ride with maybe just early rise would have been the ticket. Still...I can't see me toteing around 3 pairs of skis but I may have been better off grabbing the MX78's. Maybe a Rossi S3 which I gave to my son could have been a better choice for that day. Poor is the person who does not have spot in the quiver for a ski that just rips very heavy, piled up crud, and, of course, they must be available when skiing 2000 miles from home......duhhh, that's what rental shops are for! Mike, Lynn -- you guys are crackin' me up here! Rolling on the floor.....!!!! My point for the past several years is that I don't need help skiing powder which is easier to ski than crud and chop. I want a ski that will ski the crud and chop well and still do OK in powder. That is a trad cambered ski with no tail rocker with a longer running length and reasonably stiff. I ski with several guys at my home mountain that ski on bananas. In the pow they move pretty quick but once they hit chop they have to dial down the speed massively. I go easily twice as fast at they do and on a pow day that means I am getting in almost twice as many runs. Where they seem to slow down the most is on groomed snow where there is fresh pow on top and it gets cut up. They slow to a crawl in this as the skis don't have the running length (key part of the equation) or the stiffness to rip through this. I still have trouble understanding the logic of skiing a ski that is designed mainly for pow and very soft conditions when at most resorts those condistions last only about an hour or so and the rest of the day requires a ski with different characteristics. the nice thing at stowe is open slope crud busting is the last thing that a ski needs to be good at. which the RP112 does not do well at. The RP112 is one of the best tight places powder skiing while still be ok on hardpack skis out there. It makes a great touring ski due to it tight turn radius, lightness and ability to deal with any snow your find in the BC. But all of that makes a pretty bad crud buster. Blizzard Coshise - super versatile rocker on this skis seems to be off no hinderance. The 193cm killed it in crud for me. Blizzard will be getting my money for a pair of 193cm before my spring snowbird trip. Head IM103 -hands down the best for the rock star set on the mountain. 103mm waist,32 to 40 meter sidecut and full camber, with a SG style tip. This skis is basically the best full cambered Mach 7 crud buster ever devised. Dynstar XXL - in the 187 this was my go to non powder but still soft ski at Snowbird. For deeper crud my current tool is the Icelantic Shaman in a 174. Yeah, easy to ski and busts through anything. 184 is still has a reasonably tight turn radius. John, re. your original post -- I couldn't agree more. As a general comment, folks on this forum are very focused on technique -- PMTS, Clendenin stuff, etc. 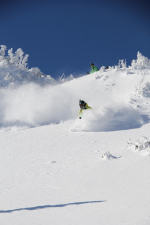 -- but that talk seems to be mostly focused on hard snow skiing / carving, with a smattering of all-mtn. stuff like crud and bumps. The finest, most subtle moves of hips, knees, ankles, toes are dissected and analyzed and discussed at length. However, correct me if I'm wrong, those discussions don't really seem to be happening around powder skiing. I'm curious why? Do not enough of us ski powder to make for lively discussions? 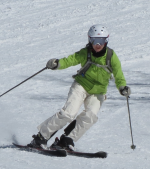 Or does the advent of rockered skis, together with the trend to much wider skis, make it so easy that good skill, technique and form are not that important any more? Rocker + Fat Ski = Easy-Peasy? Seems to me that before the rocker thing became The Latest Thing, people with even a modicum of skill were skiing powder just fine. For decades. In leather boots and cable bindings and narrow straight wooden varnished skis. My father grew up in Germany, and every winter went ski touring in the Alps and Carpathian Mtns. with just that kind of kit. A knapsack on his back, he skied from village to village and stayed in little inns. He didn't need rocker and 115 mm skis to ski powder. Just the right technique and the guts to get out there and just ski and enjoy the amazing mountain scenery. Hey Lynn....certainly yellow and flying and made the day interesting....OK Mike....yes, I thought about renting as both Alice and Terryl did..they were on BMX98's....however, the curious in me decided that since this was my quivver choice, I MUST ADAPT....and I learned too with no bruises. Do I think there's a spot in my quivver for my DPS..oh yeah cause skiing in tight areas or boot high and above they are soooo much fun but for me, I realize I'm missing something! JB I'm not saying the DPS are unversatile..just saying I find one thing so far it does not do well for my intended uses. Still I'm not sure there is that one perfect ski that does all well..hmm....just like the all purpose golf club that has 17 different settings for the head and it's length......now that would be one heck of a ski. The DPS does handle chop and crud well but soft snow, not heavy wet compacted snow. As long as the snow can be pushed around, the skis handle fine. Svend...as were discussing on phone....I find the techniques I use with traditionals skis in pow, groom, or any 3d snow still apply to the DPS....just that for me...that yellow bannana is a fun fun ski, quick to turn, float and push through SOFT snow. AND I must admit...your father I'll bet was one heck of a mountain man! Gary, I was skiing the same crud in Montana that weekend. As crud goes from light to heavy, what you were skiing was a 4 or 5 on a scale from 1-10. You havent seen heavy crud until you ski Tahoe or PNW resorts. The snow in Jackson and SW Montana (3 hours away) was definitely heavier than usual but it was a long ways from I would call heavy crud. My point about the skis not being too versatile is that if they were getting tossed in JH crud they would be downright unskiable in Sierra Cement. JB...Iam lol...we're comparing the moisture content of snow? Not that it matters....we live on the Great Lakes..and yes we have 100% himidity many snow days....But hey...having never skied Taos, I can't say. I can say where we skied at JH at mid to lower mountain....it was heavy solidified piles of crud on the trails, better in the trees. I'm just saying my experience tells me the DPS is not a heavy wet compacted compressed snow ski....BUT it will be a blast in spring snow that can be pushed around....spring slurry......the temps soften things up and it's skiing butter. Finding the right tool no matter what the moisture content can make all the difference in the world. Max....versatile the word I understand but there will be strengths and weaknesses IMO, pluses and minuses....when you find that perfect ski that does everything absolutely the best FOR ME.....I'll buy one! For PMTS the technique discussed applies to pow as well. Got it - thanks Max. Not being a student of the technique, I didn't know that. Spend enough time on technique and at some point the need for the perfect all around ski becomes unimportant. This is so true. I'm as guilty as anyone in always wanting the 'right' ski for every condition. Yesterday I skied with a fellow Patroller. Now this guy has only one pair of skis. and that one pair is a 7 year old Atomic SX7-which is an intermediate level, skinny frontside ski. All we did yesterday was chase down unbroken crud, trees, and bumps--we did a lot of off-piste skiing in difficult terrain on very tricky snow. I changed my skis twice during the day. This other guy, owning only one pair of skis never switched. And he absolutely kills it. Honestly (and GreenTrails or Beastie Boy will confirm this as a true story...I'm talking about Scott G) no matter the terrain or condition, he rips through it, faster than the rest of us, smoother than the rest of us, and he adds a lot of aerial flair. Personally, skiing with him is one of the biggest confirmations of "skill over skis". Every time I ski with him I realize I put too much stock in ski design and that the search for the perfect ski is fruitless. Just saying for me...having the right ski for the conditions makes it a lot easier to be on snow 4 to 5 hours daily, 5days of skiing....OR...just playing on the weekend at our local mountain. I may not be as gifted as Scott with his skis both physically and technically....so what keeps me having fun, expending less energy, is a ski that works for the conditions. I agree with Max too...competent ski technique can allow you to ski any gear any time or place...but the performance factor and tiring factor in my mind play a big role in the enjoyment factor. I must be a gear ****! No one, or probably very few are bigger gear whores than I am. I have too many skis and I never seem to stop buying more (I do love skis and I do love the variety). Having said that I will not allow myself to think while I am in the mdist of a run, "I wish I was skiing my ____ skis". I have skied a lot this yer on my Head Icon TT 80's and they are carving skis that are quite versatile. I have definitely skied them a ton this year when a wider ski may have been the better tool but I have really enjoyed skiing the TT's. What I lose in float I make up with substantially increased maneuverablility. As well when I get deeper snow on skkiny skis I reallly need to flex at the end of each turn to release the skis. What I realize is that I have a great opportunity to work on some aspects of my skiing that I would not otherwise need to suse to as a full an extent if I was on fatter skis. To me the key is never allowing the mindset that I would be skiing better if I was on different skis.